Lori and I were heading up to Mendocino for Memorial Day weekend and wanted to get an early start on Friday to beat traffic. However, we couldn’t check into the house we were renting until 4pm. We thought going straight up 101 and heading off to Mendocino on Highway 128, with maybe a stop in Geyserville for lunch and wine tasting. But then inspiration hit: Cut off 101 on the 116 west toward Sebastopol, stop at Merry Edwards Winery for a tasting, then find lunch somewhere in that area. We had previously met Merry Edwards at a Russian River Valley Winemakers event a few years back, and tasted her Pinot Noir at that event, and really liked it. She is one of the first, if not the first, women winemakers in the Napa/Sonoma area, having started her winemaking career in the early 70s. 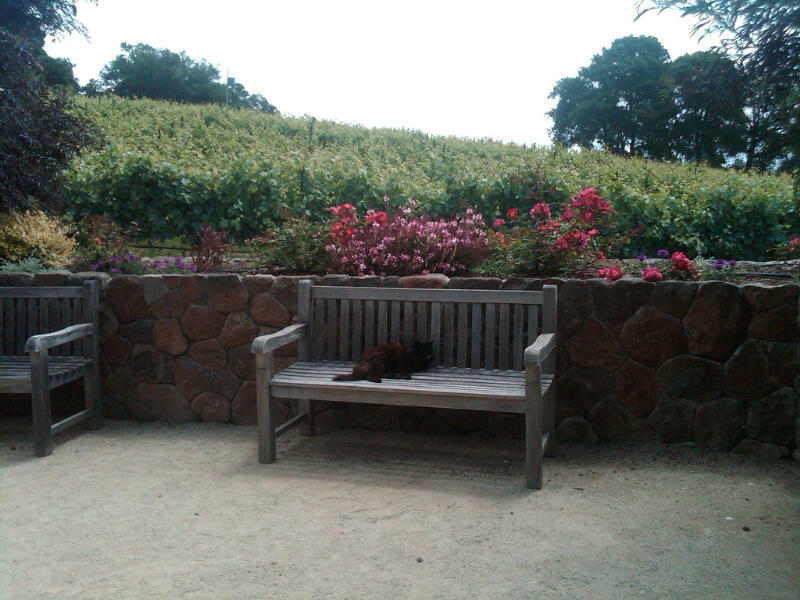 Her eponymous winery was founded in the late 90s to make Pinot Noir. Sometime mid 2000s she started making Sauvignon Blanc, which turned out so good it was the first Sauvignon Blanc (the 2007 vintage) put into the top 10 wines of the year by Wine Spectator, and continues to win awards. 2011 Chardonnay, Olivet Lane Vineyard: 100% malolactic fermentation, but not an extreme buttery taste. I forgot to ask, but I’m assuming that there was not a lot of new oak used on this wine. An enjoyable Chardonnay. 2012 Pinot Noir, Sonoma Coast: This is a blend of a few vineyards, a lighter bodied Pinot Noir but well balanced. Actually it was our favorite, although the couple tasting with Lori and I liked the other Pinots better. 2012 Pinot Noir, Meredith Estate: Bigger, more fruit forward Pinot Noir, with some significant tannins on the finish. 2012 Pinot Noir, Georgeanne Vineyard: The warmest weather vineyard for Pinot Noir that Merry Edwards uses. Good now; but needs more time to come to terms with its different components. After picking up a few bottles from Merry Edwards, we headed off to Underwood in Graton for lunch. We’ve heard about this restaurant for a long time, but never eaten there. Every time we’ve been in the area for lunch/brunch it’s been closed; our poor timing. (They’re not open for lunch/brunch on Sundays.) This time though we scored. We took a quick look at the regular menu, but the daily specials enticed us. 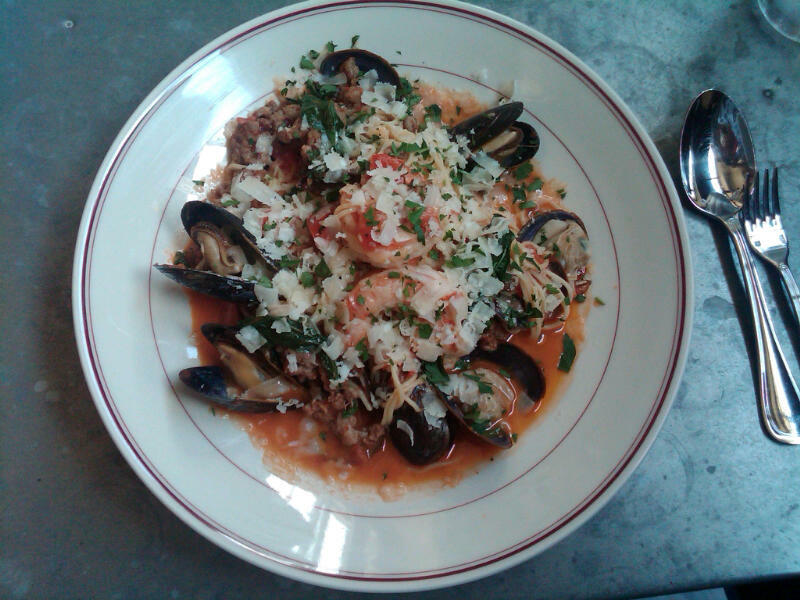 Lori had a delicious chicken sandwich, and I had this wonderful seafood capellini. We did eventually make it to Mendocino. We were joined in Mendocino by our boys and their families, which made for a wonderful weekend. Sunset over the Pacific, through the fog, was beautiful. The beach was fun, even if both air and water were a bit cold. And we saw a parade of grey whales late one afternoon, 5 pairs of mothers and calves, about 100 feet off shore, heading back north for the summer. This entry was posted in wine travels and tagged Chardonnay, Merry Edwards Winery, Pinot Noir, Russian River Valley, Sauvignon Blanc, Underwood on May 30, 2015 by vvblogman.